People would rather read about their own marriages and separations and trips to Tanglewood. There's an entire school of American fiction which might be called around-the-house-and-in-the-yard. And I think people like to read this kind of work because it adds a certain luster, a certain significance to their own lives. 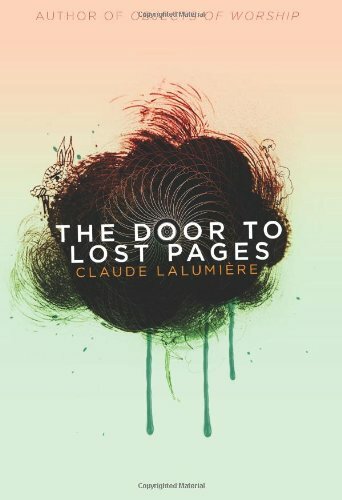 As a work about the consolatory power of books and the joys of obscure bookshops, Claude Lalumière’s novella The Door to Lost Pages stands accused of aiming to add a certain luster of significance to the lives of people who make up the book's audience; people who seek solace in their reading material, people who find joy in the discovery of a forgotten book by a cruelly overlooked author. People, in other words, like you and me. Mercifully, while The Door to Lost Pages does suggest that salvation lies in books, Lalumière's vision of the path to salvation leads much further afield than around-the-house-and-in-the-yard. The Door to Lost Pages is made up of a series of interlinked short stories revolving around the eponymous Lost Pages bookshop. In the first chapter "Bestial Acts," two characters use the shop as a means of escape; Lucas is locked out of an unpleasant world that forces him inwards into a world of books and Aydee is locked into an equally unpleasant world that forces her outwards until she finds the more welcoming world of Lost Pages. Both characters are miserable, both characters are broken, and yet both characters find a sense of place amidst the bizarre books and creaking stacks of Lost Pages. Having set the terms of engagement and established Lost Pages not merely as a setting but as a spiritual destination, Lalumière sets about regaling us with other, more or less successful, attempts to find the way to the bookshop. "Let Evil Beware!" tells of a little boy who uses the bookshop to research the monsters that he assiduously hunts whenever he is out of school. Having introduced the fantastical in the shape of a dream-like sequence in the first chapter, this chapter muddies the waters. In "Bestial Acts," the fantastical is terrifying and yet benignly incomprehensible, but in "Let Evil Beware!" it becomes something that can be researched, understood and defeated. "Dregs" further muddies the water by telling of a young man who experiences a night of life-changing bliss in the arms of a man whose beauty is so absolute that, were it not for a nearly empty bottle of magical potion left on his bedside table, it would be all too easy to dismiss as a simple dream. Much like the other characters in the book, the protagonist of "Dregs" has a link to Lost Pages, a link he uses to try to make sense of his experience, but while Lost Pages has the answer to all of his questions, the answers are oddly unsatisfactory. Perhaps the mystery was more vital than its solution. "Dark Tendrils" sculpts the fantastical into a more manageable form. When a young man notices an older man taking an interest in his girlfriend, he reacts with hostility and is rewarded by a torrent of nightmares for his troubles. Unsure of what is happening to him and why his girlfriend is attracted to the mysterious older man, the protagonist arrives at Lost Pages but refuses to listen. Why should he pay attention to any of these books? Why should he spend time in a dump like that? Needless to say, this story does not end well. While some of The Door to Lost Pages is fresh, some of its component chapters have appeared in print before in venues ranging from Interzone to The Mammoth Book of New Erotica 4 . Because it was written over a long period of time and because its component parts were evidently designed to fit a number of different venues, The Door to Lost Pages has a somewhat chaotic feel. Like the shelving in the sort of quirkily off-putting bookshop that sits at the heart of its story, The Door to Lost Pages feels like it is the product of someone taking a number of different stories and jamming them together on a shelf with little interest in whether or not they actually fit. From urban fantasy to erotica, the novella veers wildly from different genres and attitudes to the fantastic with nothing but a bookshop to hold it all together. This sense of internal instability becomes more obvious as the book draws to an end. Is Aydee right or are these the escapist fantasies of a crazy homeless person? Lalumière suggests that both possibilities might well be true as the story introduces the idea that Lost Pages exists across universes and that its books and people take different forms depending upon where they are at any given time. Lalumière further expands this idea in the Coda entitled "The Lost and Found of Years." Starring himself reinvented as a successful author whose work gets made into films (starring Johnny Depp!) and TV series (made by HBO, naturally), this final story presents the journey to Lost Pages not as a journey home or of self-discovery but rather of depression, madness and loss. The Door to Lost Pages is a book that never quite snaps into focus. Between shifting genres, changes in tone, and a mysteriously elusive but seemingly coherent fantastical background, the book defies not only easy categorization but also any sort of top-down attempt at interpretation. Lalumière invokes mythical beings rippling with symbolic power but any attempt to pin the book's mythology down to a single coherent set of values or ideas seems doomed to failure as each new story brings only conflicting messages and further mystery. The book's elusive quality is evocative of life itself; many paths open before us, each of them rich with possibility, but none of them is the right one and none of them guarantees either success, spiritual fulfillment or happiness. We all seek our own door into Lost Pages but each path to that door is different and the door will seem different to all those who manage to reach it. Jonathan McCalmont is a freelance critic living in the UK. Now an articles editor at Strange Horizons , his work has also appeared in The Escapist , Salon Futura , Gestalt Mash , Foundation , The New York Review of Science Fiction , and Vector . He also maintains a blog named Ruthless Culture where he writes about films, literature, and the fundamental hostility of the universe. Jonathan McCalmont lives in a wood in East Sussex. Twice shortlisted for the BSFA Award for Best Non-Fiction he writes mostly about film on his blog Ruthless Culture and mostly about science fiction as a regular columnist for the British science fiction magazine Interzone.